12601 Southeast River Road has a Walk Score of 26 out of 100. This location is a Car-Dependent neighborhood so most errands require a car. 12601 Southeast River Road is a 10 minute walk from the MAX Orange Line at the SE Park Ave MAX Station stop. This location is in Milwaukie. 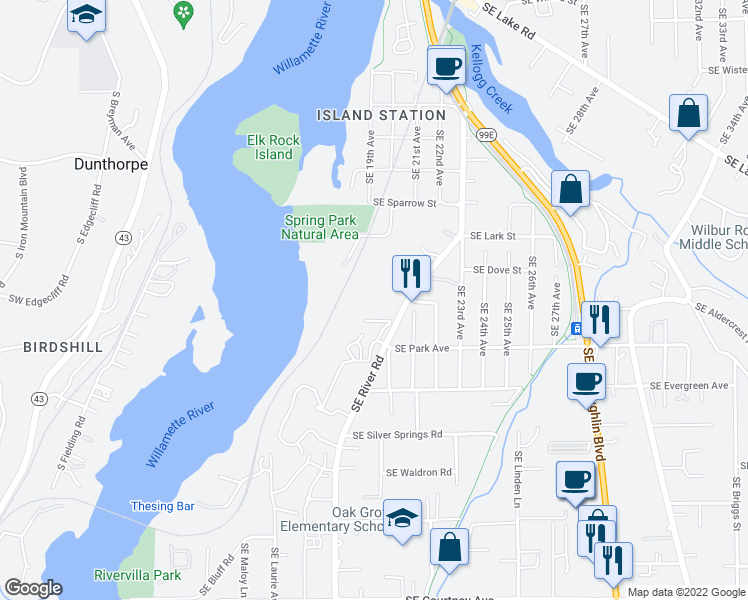 Nearby parks include Spring Park Natural Area, Elk Rock Island Natural Area and Bunnell Park. Explore how far you can travel by car, bus, bike and foot from 12601 Southeast River Road. 12601 Southeast River Road has some transit which means a few nearby public transportation options. Car sharing is available from Getaround. This location is in the city of Milwaukie, OR. Milwaukie has an average Walk Score of 48 and has 20,291 residents.